Last year, the Altoona, Pa., City Council approved filmmaker Morgan Spurlock’s offer to change its name to POM Wonderful Presents the Greatest Movie Ever Sold, Pa., for 60 days. The city received $25,000 to participate in the documentary scrutinizing advertising, naming rights and product placement. Getting support and approval for longer-term and more serious naming rights agreements, however, can be more difficult. That is especially true for transit authorities looking to rename stations and lines, which do not have as much of a history with naming rights as other assets, such as sports and entertainment arenas. “Some authorities just don’t like to have any advertising,” says Barbara Hansen, general manager of the Detroit Transportation Corporation (DTC), which owns and operates the Detroit People Mover, a light rail system that runs through the city’s central business district. Opponents of transportation-related naming rights argue that renaming lines and stations can be confusing to riders. It also can violate city and authority regulations regarding advertising. 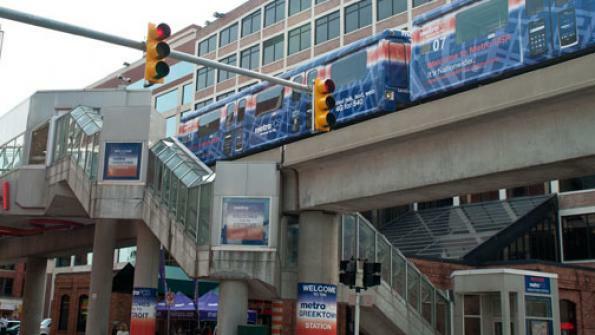 When DTC changed the name of the People Mover’s Greektown Station to the MetroPCS-Greektown Station, it worked with the city to ensure that the name change did not violate any of the limitations regarding advertising within the city limits. The Greater Cleveland Regional Transit Authority (GCRTA) did not have a difficult time selling the naming rights for its HealthLine that runs through a redeveloped area of the city. In addition to the naming rights — which were bought by the Cleveland Clinic and University Hospitals — GCRTA also wanted to sell station sponsorship packages that include advertising at several stations. The two medical entities agreed to the sponsorships as long as they could approve them.